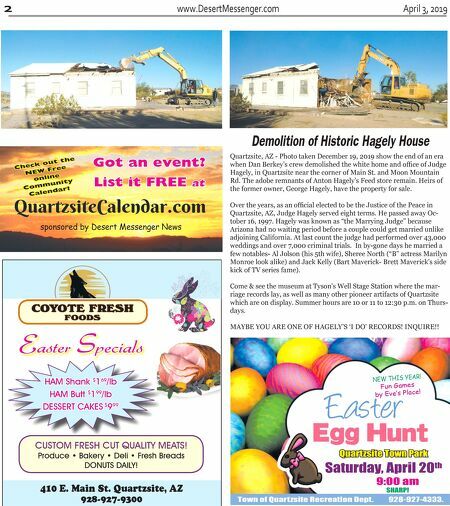 Desert Messenger is your local connection for news, events, and entertainment! April 3, 2019 www.DesertMessenger.com 3 Heroes Appreciation Day celebrated Quartzsite celebrates its first Heroes Appreciation Day By Joanne Winer Quartzsite had another first on March 2nd this year when they cel- ebrated the very first Heroes Ap- preciation Day held at the Heroes Bell Gardens in Celia's Rainbow Gardens. Despite the windy day, and a few glitches in the planning and carrying out of this first event, it was a very great ceremony with a lot of love thrown in. We got into a bit of a panic when Commander Holt of the VFW Post 769 ended up in the hospital with a heart attack and we had to scramble to find others to take part in the cer- emony in his place. The VFW Rid- ers President Bobby Cleveland and the Auxiliary President Roy Austin as well as past commanders Den- nis Dole and Bob Braa stepped in to help. It was a wonderful group who came from the VFW to show their support. They even brought along the Junior Honor Guard to be part of this great event. Thanks to the VFW, the Freedom Riders and the Junior Honor Guard for mak- ing this such a special event. We all wish Commander Holt a speedy recovery. Law Enforcement officers from the Quartzsite Police Dept., Chief William Ponce came, as well as two officers from Arizona Dept. of Public Safety (DPS) and they represented everyone well. The Quartzsite Fire District was well represented with some of the new cadets coming as well as Chief Kevin Hess and sever- al of the firefighter/EMTs from the area. There was a also a group from the Quartzsite Elementary School PTO who had some goodies they sold and gave the donations to the Heroes Area and Operation Hero Comfort. A very special thank you to Mayor Norm Simpson, who cancelled a trip to Phoenix to be there, and also to Vice-Mayor Loretta Warner who was not feeling well but came as well. Councilwoman Starr Bearcat was also in attendance. Thank you all for being there. Also thanks to everyone who spoke at the cer- emony and to all who attended--it wasn't the crowd we hoped for, and I was a little upset, but one of the DPS troopers thanked me after the ceremony. He stated that not ev- eryone honors the police and some others, and it was nice to be hon- ored in this way. He also told me that although I was upset that more people weren't there, it was the ones who WERE there that counted and he was right. We are planning on starting build- ing the bases for the monuments very soon and will be having several work sessions soon to work on the monuments. We are still looking for volunteers who know how to lay cement block, or materials needed to work on the monuments, like ce- ment blocks, patio stones, colored rocks, cement, rebar, any cacti or plants, etc. Anything that we can get donated will help. By next Heroes Appreciation Day in 2020, they are hoping to have the monuments done and the landscap- ing finished so we can have a dedi- cation ceremony. Please look in the paper and online for any work ses- sions or fundraisers we will be do- ing to raise money for the materials. We need to get them done. Thanks to everyone who came and partici- pated this year and we hope to see a bigger turnout next year!! FREE CLASSIFIEDS Desert Messenger offers FREE Classified Ads! HERE'S THE SMALL PRINT: Items for sale under $1000. Private Party Only. 1 per month. Yard/Ga- rage/Craft Sales, Wanted, Give-a-ways, Free, Lost & Found, etc. (non-commercial) For more information, contact Rain at 928-916-4235 or Email: Editor@DesertMessenger.com PHOENIX - The Arizona Department of Transportation will have crews working on improving the intersection of Avenue 8E and US 95 and is warning drivers of possible delays. The department said work will begin on Monday, April 1 to install a new traffic signal, build concrete pedestrian ramps and repave the intersec- tion. Crews will be working between 7 a.m. and 4 p.m. weekdays. US 95 will be restricted to one lane between Avenue 7E and Avenue 8E. Avenue 8E will remain open for much of the work, with occasional closures dur- ing installation of the traffic signal and paving. The project is expected to be finished in late October. ADOT suggests for those trying to avoid delays, use 24th Street between Araby Road and Avenue 9E. Drivers traveling north on US 95 to the Yuma Proving Grounds and Quartzsite can take Interstate 8, exit at Fortuna Road, and drive north to US 95. 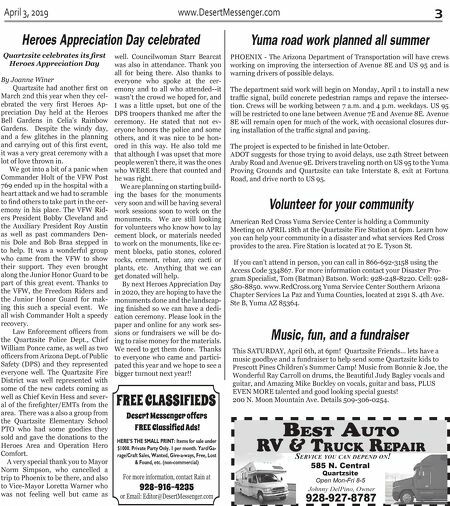 Yuma road work planned all summer American Red Cross Yuma Service Center is holding a Community Meeting on APRIL 18th at the Quartzsite Fire Station at 6pm. Learn how you can help your community in a disaster and what services Red Cross provides to the area. Fire Station is located at 70 E. Tyson St. If you can't attend in person, you can call in 866-692-3158 using the Access Code 334867. For more information contact your Disaster Pro- gram Specialist, Tom (Batman) Batson. Work: 928-248-8220. Cell: 928- 580-8850. www.RedCross.org Yuma Service Center Southern Arizona Chapter Services La Paz and Yuma Counties, located at 2191 S. 4th Ave. Ste B, Yuma AZ 85364. This SATURDAY, April 6th, at 6pm! Quartzsite Friends... lets have a music goodbye and a fundraiser to help send some Quartzsite kids to Prescott Pines Children's Summer Camp! Music from Bonnie & Joe, the Wonderful Ray Carroll on drums, the Beautiful Judy Bagley vocals and guitar, and Amazing Mike Buckley on vocals, guitar and bass, PLUS EVEN MORE talented and good looking special guests! 200 N. Moon Mountain Ave. Details 509-306-0254. Volunteer for your community Music, fun, and a fundraiser 585 N. Central Quartzsite Open Mon-Fri 8-5 928-927-8787 Johnny DelPino, Owner BEST AUTO RV & TRUCK REPAIR SERVICE YOU CAN DEPEND ON!